The Funky Felter: I've been Mintd! Well, after seeing many of my favorite Etsy sellers migrate to Mintd and open shops, I decided to as well. 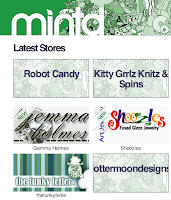 Yeah, that's right, now I have three online shops to keep up with, my Etsy shop, my Ecrater shop, and now a brand new Mintd shop. Both the Ecrater shop and Mintd shop are still very much in the building phases. I primarily still sell through Etsy, which I adore, but I plan to better develop both of my other shops when I have more time this summer. So why did I do it? Because Mintd seems to have a super set up. The Australian based website is very modern and clean in its design. It also has neat and original features such as Lookbooks which I'm still trying to figure out, but I did post one of my very own today called Pink Swirls for Girly Girls. And yes, it is very pink, girly, and swirly, but it is also bright and fun and filled with accessories too. I think that the magic number is three, though. In other words, I don't plan on adding any more online venues to sell from, but Mintd was just too good to resist. I can't wait to see what results I will have. Honestly, I haven't had much response on Ecrater, but I also haven't developed my store so that could be it too. Hopefully, Mintd will prove to be profitable, interesting, and fun. I already like the community there and have joined their Flickr group, Mintd Styles. They also gave me a free plan upgrade to their "Pro Plan" as a promotional for being one of the first 200 shops to register. So thus far, big kudos to Mintd . . . we'll see how it goes. I hope that I can keep up with it all, but at least I'll have crazy fun trying! I just got my orange wool ring today and I love it!! !